I am often drawn to a book by its cover and the beautiful cover of “The ABC Field Guide to Faeries” immediately pulled me into this story. But it was the wonderful message of preserving our environment that made me recommend it to friends and family alike, whether they have children or not. What child’s imagination isn’t captured by faeries? Susanne Alexander-Heaton takes each letter of the alphabet and introduces us to a faery whose name begins with that letter of the alphabet. 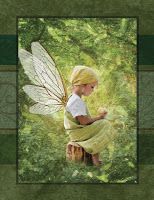 Each faery has a positive message associated with who they are, from Avriel and Ataija, two faery sisters who teach the importance of balance, to Zoryana who can be found among the plants, and reminds us that plants are necessary for a healthy environment. The messages will encourage and remind us just how important respecting nature really is. Beautiful artwork together with rhyming prose allows this book to flow very well. I read this book on my Kindle Fire and was just stunned at the beauty of each page. A book that certainly put a smile on my face and I believe that it will do the same with any reader. It is not only a great book to introduce your child to the alphabet but perfect for teaching them how to take care of the planet around them. Though I think this book is perfect for children I think young and old alike will enjoy it. I think this book would also make a wonderful, but thoughtful gift.